So I love to blog, read blogs and normally every afternoon I enjoy popping over to a few that I follow. Many are mommas (some I know, some I don't) like me, they encourage me and also give me great ideas to implement in our own home. One of the blogs I recently started following (after finding on instagram) is Mix and Match Mama . She happens to be the sister to a famous bachelor and recently adopted from China (which piqued my interest since my sis-in-law is in the middle of that process). Anywho, I now read daily! Its light and fun and full of gems! One of them being, she does monthly goals. They seem to be practical and priortized to things like life, faith, family and personal goals that are attainable. 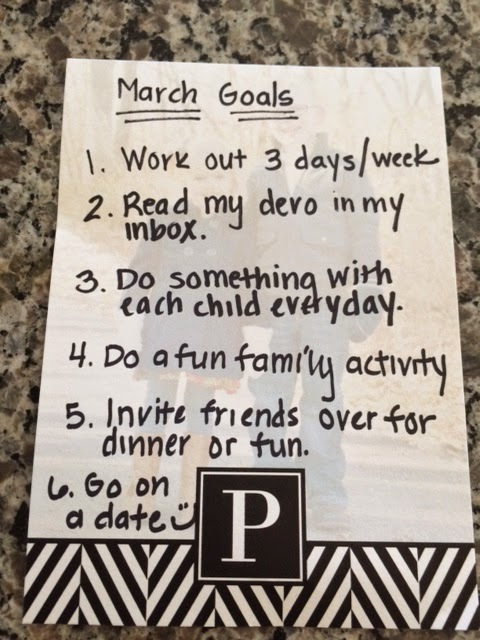 Given the season of life I am in and feeling like I can.not.accomplish.a.dang.on.thing I thought some simple goals for the month of March would help me to focus on what matters and help me feel like I am doing something around here! As I alluded to in my belly bump update. Getting to the gym 3 days during the work week is getting increasingly more difficult between OB appointments, preschool, tumbling classes and the desire to be home at least one morning a week with nothing on the docket. SO I am having to try to squeeze one workout in on the weekend which I am not used to. I used to squeeze in an early morning workout but these days I am not going there ;). So here's to hoping all 4 weeks of March I can hit the gym 3 times per week. For me its not just about physical health but emotional wellbeing as well. 2. Read my devotion in my inbox. I signed up for a proverbs 31 devotional that pops into my inbox every morning. It is simple to read, relevant to my life and encourages me...I have NO excuse to not do it but I am stubborn. My goal is to read it everyday and start my day off right! 3. Do something with each child everyday. If I don't plan to do this, our days slip by and I haven't had a chance to connect in a meaningful way with each child. It could be going to the store alone with them, playing a game with them, sitting down and playing babies with V or building with legos with Solon. I am not talking hours on end but just sitting down and being present with each of them for a few moments each day. I see the days slipping by but feeling so crappy, I have to make myself get off the couch and DO IT. 4. Do a fun family activity. We are currently in a family series on Sunday nights at church "Playing for Keeps". It is a series based on the orange philosophy out of Andy Stanley's church in Atlanta. The premise is for parents to be intentional in their parenting role. Use words wisely, take moments and make memories, etc. One of the things they have encouraged us to do is carve out a time each week to do something phone/ipad free with the family. The kids have had fun picking out our February activity, let's hope our march one can include being outdoors ;). 5. Invite friends over for dinner. We love having people over but with me being so sick, we just haven't had the opportunity. Now that I am feeling better, we want to get better about enjoying our friends more. We hope to get our small group connected for a fun evening at our home and have some dates out to dear friends in hopes they can come over for a soup dinner and games! 6. Go on a Date :). Scott particularly LOVED this goal. Babysitters are expensive and if we don't place it on the calendar, it.will.not.happen. Another area we need to be intentional, it feels so good to get out together alone but we don't do it often enough. This month we are going out, if I weren't pregnant, we would be ice skating (much to Scott's disgrace) but we will come up with something! SO there you have it - my monthly goals. Yearly goals are too hard for me. 30 days is hard enough to stay on the bandwagon and be accountable. So I am going to give it my best and come back at the end of the month and share. What are your goals for the month??? Where do you need to be intentional?